16 free Nordic healthwalking taster sessions for people interested in improving or maintaining their health and well-being are on offer at six different locations. Dates are 24 & 26 to 30 September and 1 & 2 October. Poles are provided. On Sunday 25 September, a special fundraising Nordic walk is available for competent Nordic walkers. A donation is required. 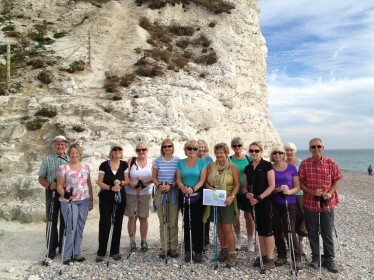 For more information and how to book, click on Sussex Walking Festival These events are being held to raise public awareness of and support the new Nordic Healthwalking charity. Nordic Walking for Health is running these events during the upcoming Eastbourne & Wealden Walking Festival: Taster Sessions – free of charge 1pm Saturday 26 September, Forest Row 11am & 1.30pm Thursday 1 October, Buxted Park Nordic Walks – £5 per person 10.30am Saturday 26 September, Ashdown Forest Centre 11am Tuesday 29 September, Seven Sisters Country Park 10.30am Saturday 3 October, Friends Car park, Ashdown Forest For more information and how to book, click on Sussex Walking Festival and search by date.